The eyebrow piercing is one of the most popular body piercings performed. This type of body piercing is one of the least painful and one of the fastest to heal. The historical origins of this piercing cannot be directly traced to any particular culture or religious sect. Initially shocking to most people, eyebrow piercings have become commonplace and are primarily used to draw attention to the eyes. 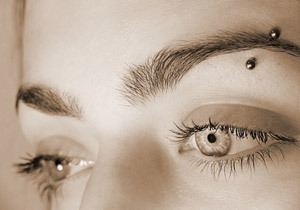 The types of eyebrow piercings are; standard (placed vertically in the outer third of the eyebrow), Erl (or bridge) piercing (a horizontal piercing through the glabella tissue between the brows above the nose), Teardrop/Anti-Eyebrow piercing (placed at the top of the highest crest of the cheekbone toward the outer edge of the eye), and the Bindi (or vertical) piercing (a surface piercing placed between the eyebrows or slightly above them). While standard eyebrow piercings have healing times between 6 to 8 weeks, the other piercings mentioned can take up to 6 months to heal completely. These piercings can be performed professionally or with a body piercing kit. The piercing is performed using a hollow piercing needle between 18g in size and 14g, accompanied by a sterile captive bead ring or barbell usually curved. The length of the barbell or diameter of the ring should be a minimum of 3/8 inch in size. Keep in mind that even when completely healed, the eyebrow piercing can easily close if jewelry is removed, sometimes as quickly as 24 hours after removal.